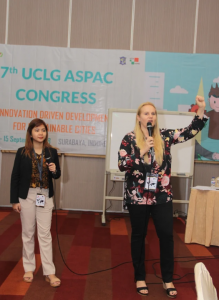 Through its Program Management Officer Mia Simpao, CDIA showcased the initiative of its city partner – Yangzhou, People’s Republic of China at the session on “Public Space-led Urban Development: Towards a Regional Strategy.” The session was organized by the United Nations Habitat as part of the UCLG-ASPAC Congress on September 14, 2018 in Surabaya, Indonesia. The event gathered key experts and government officials to discuss challenges, practical actions, lessons learned and recommendations in developing safe and inclusive public spaces in Asia. This was in line with the implementation of the Sustainable Development Goal 11.7 target, specifically to “Provide universal access to safe, inclusive and accessible, green and public spaces, particularly for women and children, older persons and persons with disabilities.” Key recommendations and inputs from the session will be contributed to the public space regional strategy of the UN Habitat in Asia. CDIA showcased its project in Yangzhou, China on Urban Renewal and Wetland Rehabilitation as a contribution to the session. CDIA supported the city of Yangzhou through the preservation of its cultural heritage, and the development of the San Wan Wetland Park from previously being an industrial waste site. Today, the public has free access to the wetland park with mixed-use facilities such as a library, playgrounds and sports facilities. Eco-tourism has also greatly improved in the city as the rehabilitation did not only attract tourists to its culture-based shops; the environmental improvement has also attracted back 40 species of birds in the wetland park. “Participatory approaches are key in developing inclusive public spaces, with the people and for the people. Purposeful public spaces should not only be attractive, but also useful to the citizens in accordance to their needs and interests. Integrated solutions are also necessary in this planning process, considering environmental, social, and economic aspects of public spaces. This is among the main lessons noted by CDIA in this project in Yangzhou, China,” said CDIA Program Management Officer Mia Simpao.